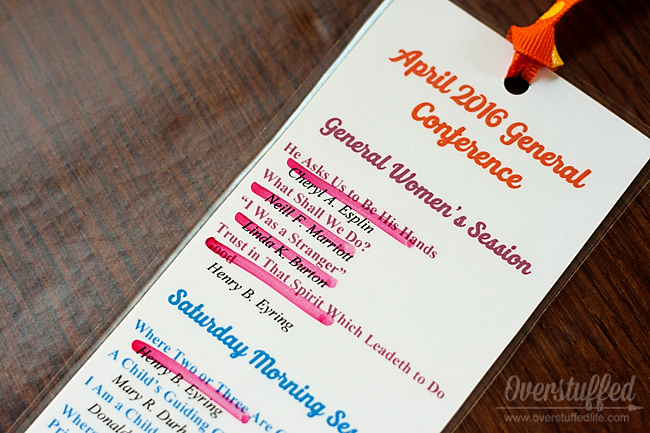 I always have really good intentions to study the conference talks before the next General Conference rolls around. I rarely succeed, though, and it's mostly just because I don't really have anything keeping me accountable. So, I decided to change that this time around. 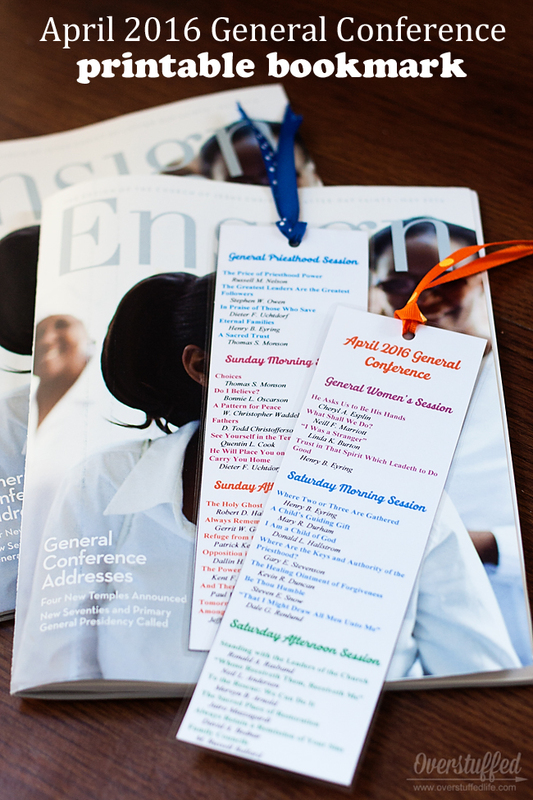 When our General Conference editions of the Ensign arrived (we always get two—one for me, one for The Maestro), I had the thought that I could make a bookmark to keep track of which talks I have read and studied. Seeing a visual reminder and being able to cross things off a list is highly motivating for me! The bookmark is two-sided. 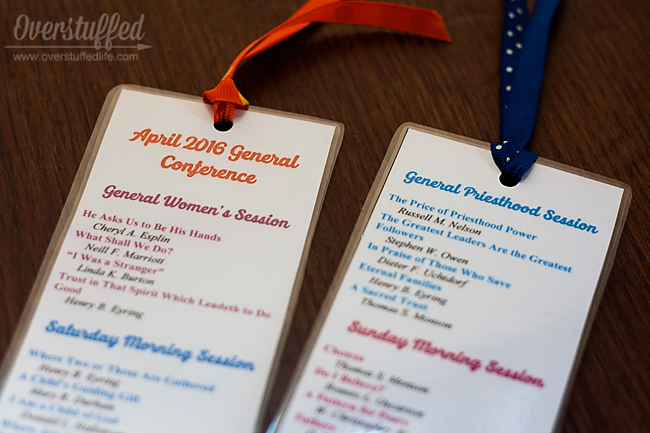 The printable is created in such a way that if you print it on one side of your cardstock and then turn it over and print it again, it will match up perfectly. You will just have to make sure that you understand exactly how the paper needs to be loaded into your printer—every printer is totally different and some of them are more complicated in the paper loading than others! For each sheet of paper, you'll have two bookmarks. I also punched a hole in the cardstock before I laminated, and then punched through the laminate as well so I could add some ribbon. Because bookmarks need to have ribbon, don't you think? I mean, if you don't think so, you don't have to add ribbon. But I thought so. Another nice perk of the laminating is that I can use a dry erase marker to keep track of the talks I study. You could even use a Sharpie, since it's not likely I'll use the bookmark again. I printed one for me and one for The Maestro. Maybe it will even motivate us to study the talks a little bit together! Either way, I'm really excited to get to studying these talks for the next several months! Enter your email address in the form below. If you are on a mobile device, click here to see the form. The printable will be sent straight to your email inbox.